In a strange twist of experimental events, chemists at the Oak Ridge National Laboratory, in Tennessee, accidentally converted carbon dioxide into ethanol fuel. The process they stumbled upon is electrochemical as they used small shafts of copper and carbon to convert the CO2 into the ethanol fuel. 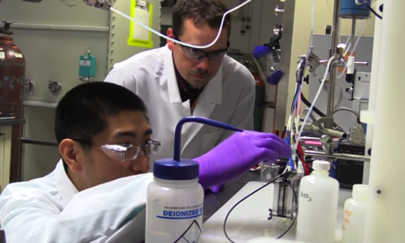 The research team sent electrical voltage into a catalyst of copper, nitrogen and carbon. The reaction they observed was unexpected. What they ended up doing was reversing the process of combustion. When this CO2 solution was placed in a container of water, it turned into ethanol. This was not a normal turn of events as such an electrochemical reaction generally ends up with several different products none of which are ethanol. The catalyst consists of carbon spikes that are infused with nanoparticles of copper. Because of this combination, the chemists were able to make the process economically viable because, normally, they would have had to use a rare, and expensive, metal like platinum to achieve the results they were looking for. Because of the multiple spikes, the reaction, it seems, has many more places to happen which helped contribute to the ethanol producing reaction.